A rebuilt 30.6 metre motor yacht has been listed for sale by Heikki Luoma at Compass International. Designed by Jon Overing, she was originally built by Chinese yard Maxi Marine with delivery in 2006 as an Island Gypsy 100’ model and went back to the yard for a complete rebuild in 2016, bringing her back to as-new condition. An interior in satin finished cherry wood accommodates eight guests in four cabins consisting of a master suite, VIP suite, starboard twin and port double, all with entertainment centres, Sony television screens and en suite bathroom facilities. In addition, there are quarters for four crew aboard this yacht for sale. The saloon comes with two three seater settees, two armchairs, coffee tables, a bar, fridge and an entertainment centre including a 55 inch Sony television screen and a Yamaha stereo surround sound system. Forward is a dining area with seating for six guests and storage cabinets for china, glassware and cutlery. Al fresco entertaining and dining is available on the large aft deck offering a U-shaped settee, table and chairs along with port and starboard stairs to the wide swim platform. More outdoor living is close to hand on the flybridge, with a bar, fridge, two L-shaped settees and two tables, all sheltered from the sun by a custom aluminium hard top. Twin Caterpillar 600hp diesel engines give her a transatlantic range of 2,530 nautical miles at her cruising speed of 11.5 knots and she is fitted with Quantum zero speed stabilisers. 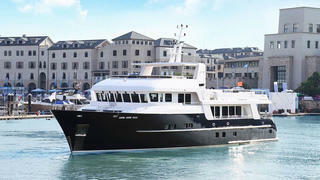 Lying in Hong Kong, the Island Gypsy 100 is asking $5,700,000.